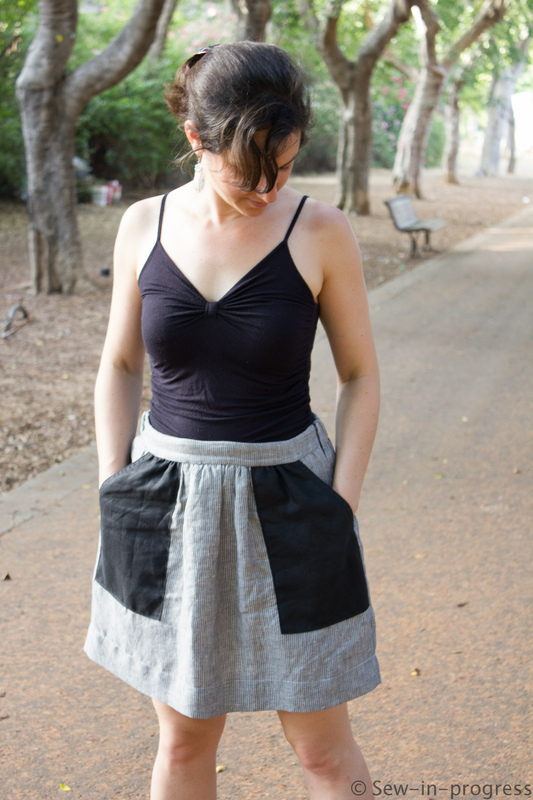 The May pattern for the #SewMyStyle project is the Pocket Skirt from Cali Faye Collection. Thanks to #SewMyStyle I discovered several designers that I did not know before. This is the first pattern that I tried from Cali Faye. I am not sure if I would go for it if it was not in #SewMyStyle but I am quite satisfied with the result. Overall, this skirt is comfortable, airy and it can easily be combined with different tops. The pattern is a basic gathered skirt with big pockets. I made size L according to my measurements and did not make a muslin. The instructions were alright. I got a bit lost at the invisible zipper and partly on inserting the elastic. To tell the truth, I already knew how to insert an invisible zipper so when the instructions got complicated, I just went my way. Other than that, I used 3cm wide elastic which is a bit smaller than what the pattern instructs. There was no way that I could be so precise with the waistband and not catch the elastic when sewing. I did not make many alterations only at the waist which came out a bit large. I basically pulled the elastic more than instructed so that the waistband will become smaller. As fabric, I used linen that I had in stock. I thought that making the pockets black would add a nice contrast. Overall, I think that this skirt is a nice addition to my basics. I already wore it twice and I was very comfortable in it. By the way, the trees are really blossoming and as you can see I could not hold myself from taking some photos.